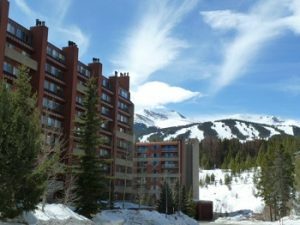 Beaver Run are a true ski in/ski out condos for sale in Breckenridge CO Real Estate. Located at the Base of Peak 9 of the Breckenridge Ski Resort and a few blocks from Breckenridge’s Main Street. Beaver Run is comprised of four buildings that were built between 1980 – 1985. There are a total of 432 residences comprised of 250 – 1 bedrooms, 158 – 2 bedrooms, 9 – 3 bedrooms, 13 – 4 bedrooms and 2 – 6 bedroom condos. As the largest condo complex in Breckenridge Real Estate, Beaver Run also has amazing ammenities. If you are looking for a place to relax and soak after a long day enjoying all that Breckenridge has to offer Beaver Run is the place. In the main building you can find an indoor/outdoor pool with 6 outdoor hot tubs along with saunas and steam rooms. There is an additional 20+ person hot tub right next to the Beaver Run Super Chair in Building 4. There is also a fitness room, arcade, rooftop tennis court, bars, restaurant/cafe, business center, ski lockers, shopping on site and a shuttle that will take you to and from town. Pets are allowed but for owners only. When looking for Breckenridge Real Estate take a look at Beaver Run condos, with all the amenities and a fabulous location you won’t be disappointed.